The Master of Arts in Communication at Washington State University is designed for individuals seeking higher-level and focused understanding of communication theory, processes and phenomena, whether their intent is to prepare for doctoral-level study in pursuit of an academic career or a communication-related career in business, government, education, research, or the communications industry. Successful completion of the program normally requires two academic years of full-time study and results in the granting of the Master of Arts in Communication. Media and Health Promotion focuses on media messages and health behavior. This includes social level analysis of mainstream and alternative media as products of and influences on the health of individuals and society; individual level analysis of psychological processes through which health-related knowledge, attitudes, and behaviors are shaped; and the creation of messages related to health and social well-being, as well as how strategic message campaigns can influence decision making and social development. Media, Society, and Politics focuses on the role that communication plays in political institutions and in creating robust civic engagement. We examine political communication from multiple perspectives and examine the interplay of emerging technology, media, and communication with information seeking, processing, and decision making. Our research focuses on both individual and societal-level outcomes. Faculty and graduate students work in teams to test and develop theory related to political communication. Science and Environmental Communication focuses on enhancing the relevance and accessibility of scientific information and local context needed for collaborative and sustainable resource management, especially among local populations most at-risk. The program focuses on environmental communication, natural or technological hazards and the use or communication of public policy. Faculty and students specialize in science education, communication campaigns, communicating risks, risk perception analysis, spatial modeling of vulnerability and adaptive capacity of human populations, audience segmentation, media analysis and public engagement. Individuals with a Bachelor of Arts degree in the humanities or social sciences may be qualified for admission to the program. However, undergraduate work in mass communication or communication studies provides especially valuable preparation for successful graduate work in communication. Persons without previous training in one or more of these general areas may be required to complete supplemental undergraduate coursework. All students in the program, regardless of their emphases, share a common core of courses and choose either to write a thesis or complete an additional nine hours of coursework and a comprehensive examination. Students are admitted to the M. A. program for fall semester. Completed applications must be submitted to the Graduate School by January 10 for fall admission. The priority deadline is December 31. The College of Communication has established the following learning objectives. Students are admitted to the MA program for the Fall semester only. The program does not admit for Spring semester. The priority deadline for applications to the Murrow College of Communication Graduate Program is November 1 for admission the following fall. Bachelor’s or Master’s degree in Communication or related field. If your degree(s) is not in a related field, additional undergraduate coursework may be required. (Note: Prospective international students must have the equivalent of a U.S. bachelor’s degree from an approved institution. )Official transcripts from each institution you have previously attended must be sent to the Graduate School. Current WSU students do not need to forward transcripts from WSU. A minimum 3.25 GPA in the last two years of undergraduate coursework. Submission of three letters of recommendation. The letters may be submitted by anyone, but we are primarily interested in references that can comment on your academic ability. Please have these individuals send both a letter and the WSU reference form accessed through the WSU Application web page. A 500-word statement of purpose explaining your reasons for pursuing a masters degree, your area(s) of interest, and why the Murrow College graduate program is particularly well-suited to your scholarly goals and objectives. Submit any additional material you feel might enhance your application. Writing samples are particularly encouraged. 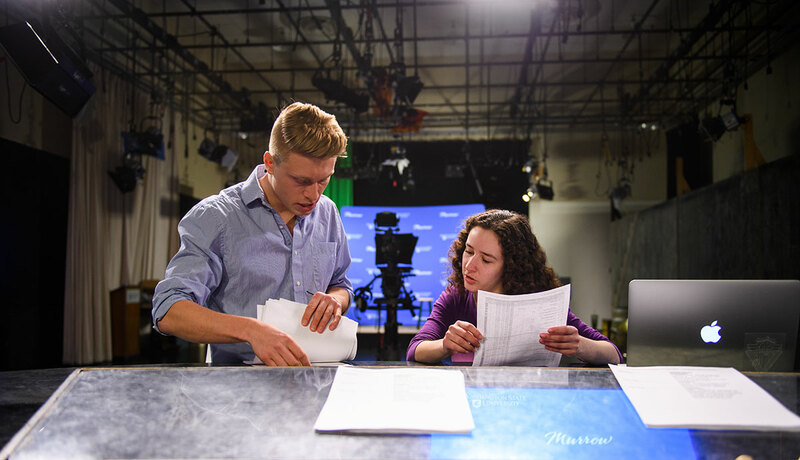 Send supplemental materials directly to the Murrow College of Communication.